application provides Muslims a platform to read comprehensive information related to the life of Hazrat Muhammad (PBUH). Read complete biography of Holy Prophet (PBUH) with stories of Hazrat Muhammad (PBUH). The application includes 13 chapters which are listed below. · Life events: It includes all the life events ever happened in Hazrat Muhammad S.A.W life from birth to departure. · Parents: Identify the parents of Hazrat Muhammad S.A.W. · Wives: This chapter describes each one of Hazrat Muhammad S.A.W wife in detail and their relationship with Him. 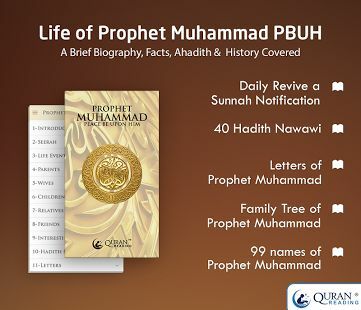 · Children: It covers brief information about Holy Prophet (PBUH) Children. · Relatives: It covers all the information about Holy Prophet Hazrat Muhammad S.A.W relatives who stood side by side in their difficult periods of life. · Friends: When all left Muhammad no one but friends (Sahaba) helped him like Abu BAKAR (RA), Hazrat Usman, Hazrat Bilal and so many others. · Interesting Stories: Read complete Islamic stories and events from the life of Prophet Muhammad S.A.W. · Hadith Nawawi: This section contains 40 Hadith (Ahadith) collection compiled by Imam Nawawi. · Family Tree: Trace complete heredity (Shajra e Nasab) of Holy Prophet Muhammad S.A.W. · Glossary and References: Identify complete meanings to difficult Arabic words and translation. Revive a Sunnah Notification :The peerless part is reviving the Sunnah. Small message templates that will help you to think and implement Muhammad Sunnah in daily lives. Read complete information about Holy Prophet Muhammad (PBUH) and try to live life according to Sunnah and hadith. So according to you this autobiography gives complete guidance - logical, then Quran is not needed? The Prophet Mohammad (Peace Be Upon Him) is an ideal example of a honest, essentially, simply, sympathetic and brave individual. Inspite of the fact that he was a man; he was far expelled from every evil characteristics and attempted only for God. So it's the obligation of each Muslim to get the learning of his life.